At 26 I have had roughly six different bed frames. From crib to twin beds (adorned with spiderman comic book decoupage) to various styles of full beds and finally my ‘adult’ bed. It seemed that as I grew and matured I wanted my bed, and bedroom, to do the same. Where I rested my head at night would be a representation of how I would wake up in the morning and start my day. Looking back at these different phases in my life, I have fond memories of these changes but also feel some guilt about all the money my parents must have spent on re-decorating and furnishing. It could have also been that these beds weren’t meant to last (their style surely didn’t). In fact, after I moved out of my parents house most of my remaining furniture was either sold, given to family or friends, or donated. Even with them converting my room into a guest room there still wasn’t a need for my outdated furniture in that space. 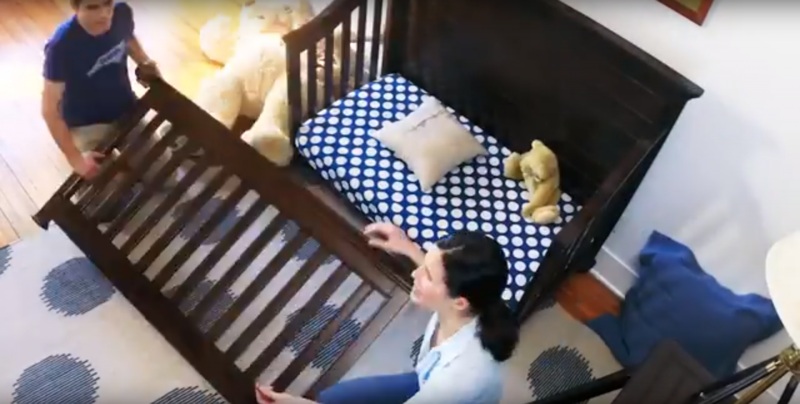 Universal Brand Smartstuff has made an effort to change the way we use cribs and children’s furniture. Their new lines like Scrimmage and Summer Hill aim to create an ageless style that will last longer than my Spider Man bed did. Their cribs can convert into toddler beds, day beds, and into a full sized bed. This means that the original crib will grow with your child into adulthood, or if they decide to part ways with the bed, parents have a guest bed for when they come home to visit! The conversion kits are easy enough to follow and the care and consistency on these pieces means that they are built to last. Come see for yourself on our showroom floor! We have both the crib and toddler bed set up from the #MyRoom Collection. This entry was posted in Cribs, Convertible Cribs. Bookmark the permalink.